It has taken a decade to get all three levels of government on board a new rapid transit deal for Greater Vancouver. Just as we are about to leave the station, two new mayors—Surrey’s Doug McCallum and Vancouver’s Kennedy Stewart—have threatened to take us off the rails. The first advocates for a higher-cost SkyTrain to Langley City rather than the approved light rail lines to Newton and Guilford. The second aims to extend the Millennium Line to UBC, an additional multi-billion-dollar cost. Regionally, we have to understand these business cases before we can get back on track with a shared plan. While Premier Horgan has indicated that the region needs to figure this out, successive provincial governments have helped create this situation. In the U.S., an analysis of more than 50 rapid transit systems found a litany of poor investments.1 In numerous situations, the high capital costs did not deliver the desired ridership, revenues or congestion reductions. The primary explanation: insufficient resident and job density. Forward-thinking states and provinces have established resident and job density targets for different types of transit infrastructure.2 In California, municipalities are required to develop regional integrated transportation and land-use plans that meet shared greenhouse gas (GHG) reduction targets.3 Once plans show reduced commuting distances and increased transportation choices, federal and state transportation funding is unlocked. This requirement has led to California’s best regional planning ever with additional benefits to public health, farmland protection and affordability. To guarantee taxpayer value, B.C. should follow suit and establish performance requirements for transit investments. This would help the public separate bona fide rapid transit schemes from boondoggles. At some $150 million per km, there is no legitimate business case for SkyTrain to far-flung, seaside towns like White Rock and Dundarave despite calls from politicians. Similarly, the province, feds, TransLink and every Metro Vancouver municipality share ambitious GHG reduction targets, which are also off track. The Mayors’ transit vision has been justified in part as a climate action investment. 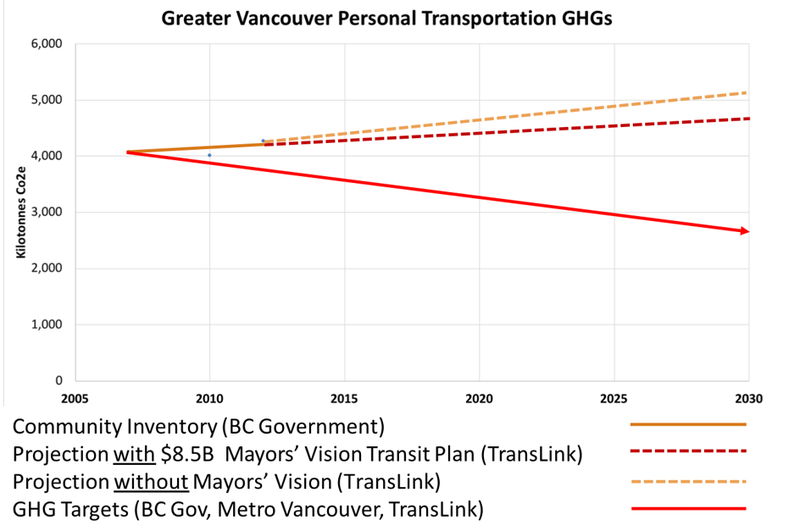 However, TransLink’s analysis shows congestion and GHG will continue to rise.4 Could the $8.5 billion investment reduce gridlock and GHGs? Certainly! It would require deeper integration of land-use plans with transportation infrastructure investments. Could McCallum’s SkyTrain expansion across Surrey serve the best interests of regional taxpayers? Sure—if jobs and residential growth are focussed around mass transit stations instead of new neighbourhoods far from good transit. Encouragingly, McCallum has emphasized the need for concentrating growth around transit stations during his campaign and as TransLink board chair a decade ago. Extending SkyTrain beyond Fleetwood to Langley City, with one of the region’s slowest growth rates, likely won’t have a solid business case for SkyTrain for two decades.5 LRT is more economically viable, but still requires more complete, compact design than planned. The business case for Stewart’s SkyTrain extension to UBC is complex. UBC’s population is greater than most B.C. municipalities—all concentrated within a couple square kilometres. While UBC’s density justifies SkyTrain, low populations between UBC and Arbutus weaken the business case for extension. Focussing growth around nodes along 10th, Broadway and Jericho Lands could change this math. 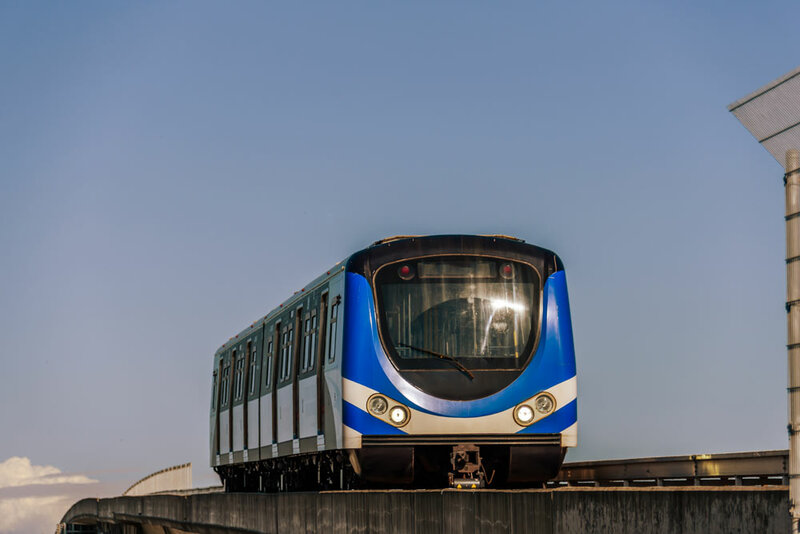 Metro Vancouver’s best bet to cut congestion and GHGs would be intensification around underutilized SkyTrain stations in Burnaby, the Tri-Cities, New Westminster and Vancouver. Behind their bold promises, the three leaders driving our mass transit agenda have tools to avoid a train wreck. Mayor Stewart was an SFU public policy professor interested in effective decision-making. Mayor McCallum’s defining trait is respect for taxpayers. Premier Horgan has vowed to meet GHG reduction targets and deliver a comprehensive climate plan. This climate plan should commit to phasing in transit investments across the region as business cases emerge. To reach our destination cost effectively, all mayors can help better integrate land use into local and regional plans. 1 Published in 2011 in the Journal of the American Planning Association, Erick Guerra and Robert Cervero compared the ridership, revenues and expenditures of 54 heavy and light rail transit investment across the U.S. Their article, “Cost of a Ride: The Effects of Densities on Fixed-Guideway Transit Ridership and Costs,” underscores the importance of employment and resident density to support cost-effective rapid transit. Key findings are available in the University of California Transportation Center’s magazine, Access. The study acknowledges high cost premiums for developing rapid transit in existing high-density urban areas, e.g. the Mayor’s Vision’s Broadway extension, and underscores that long-term revenues from ridership must be part of the decision-making equation. Typically, these high-density corridors are very cost effective. 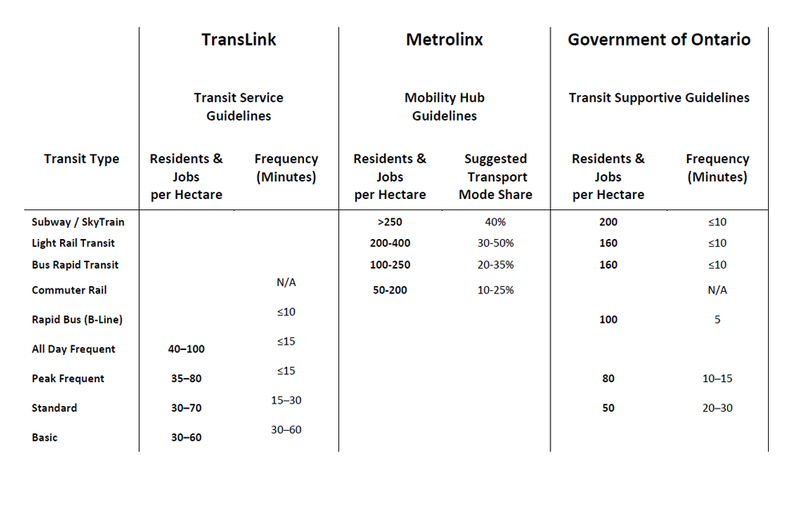 2 The Ontario Ministry of Transportation’s Transit Supportive Guidelines provide employment and resident density thresholds to support different levels of service and different types of infrastructure. These thresholds enable cost-effective transit investment that effectively generates ridership and revenue and manages congestion. Metrolinx, a regional transportation authority akin to Metro Vancouver’s TransLink, has similar thresholds to guide the development of its Mobility Hubs. TransLink has recently developed complementary Transit-Oriented Community guidelines, establishing density thresholds for transit service. B.C.’s municipalities and public transportation authorities (TransLink and BC Transit) would benefit from clearer guidelines to support integrated land-use and transportation planning that cost effectively cut congestion and carbon. While Metrolinx and TransLink guidelines go above and beyond density, outlining supportive land-use and urban design, density is a critical foundation. 3 California’s Sustainable Communities Act (Senate Bill 375) requires local governments in a region to develop shared sustainable land-use and transportation plans within their Metropolitan Planning Organization. California asserts that the state will lead on vehicle efficiency and fuel decarbonization, and local governments must lead on reducing total driving distances and mode shifting. Each of these four pillars is essential to successfully drive deep GHG reductions in the transport sector, the most stubborn to decarbonize. Plans must meet personal per capita transportation GHG reduction targets ascribed by the California EPA’s Air Resources Board, which undertakes modelling and analysis and approves the plans. Once satisfactory, state and federal transit infrastructure funds are released to local governments. The Real Estate Foundation of BC commissioned a paper by Alex Boston, Growing Smarter, which compared and contrasted B.C.’s Climate Action Charter with California’s SB 375 and a similar policy framework, the Oregon Sustainable Transportation Initiative. 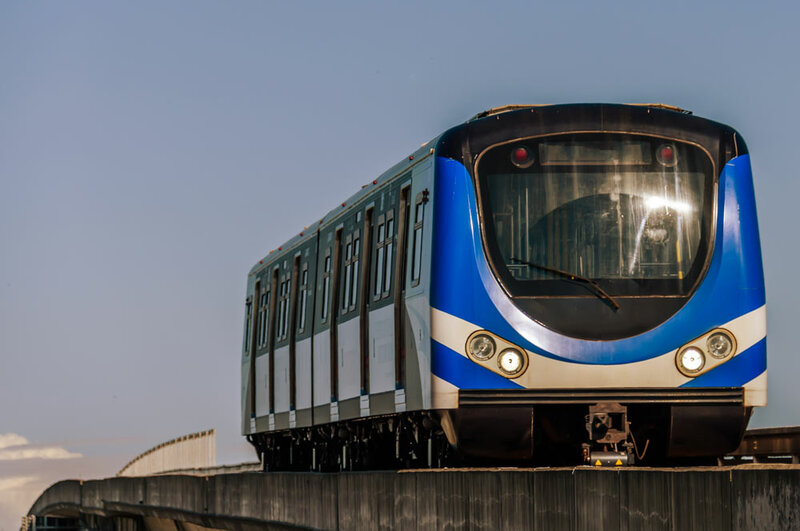 4 TransLink provided rigorous analysis of the infrastructure plans in Regional Transportation Investments: A Vision for Metro Vancouver Transportation. Appendix C (p.C-7) evaluates the infrastructure plan on multiple criteria including for GHGs. The impact on transportation GHGs is shown below, along with business as usual projections and historical trends. The primary objectives of the Mayors’ Vision are mode shifting and reducing driving distances. The table on p.9 (vehicle kilometres travelled and mode share performance) illustrates the cost effectiveness of each category of investment, showing weak performance for all rapid-transit investment. This performance would dramatically improve if greater employment and resident densities were in these corridors. 5 Langley City grew 3.2 per cent over the last census period (2011-2016), under 100 people per year according to Statistics Canada. The regional Vancouver growth rate was double that at 6.5 per cent. This content was presented to the Metro Vancouver Mayors’ Council on November 15, 2018.